Welcome to my first Facebook Friday and Give-a-way!!! First, are you on facebook? If not, why? If you are on facebook, what do you use it for? Ok, I know that it seems like a lot of questions but I want to talk to you about facebook! I have come up with an idea and would like to share it with you. I am proposing that all Fridays become Facebook Friday! On this day, I will post a fun topic for discussion about our profession or just set up a place for FACS teachers to come together, vent about your week, share ideas, network and more and its all going to take place of Facebook! It’s going to be like a weekly get together to recuperate, relax and relieve stress. You will even be able to make requests for resources, activities, and or lessons you are looking for and I will do my best to deliver. Other colleagues may feel free to respond to your requests as well. To add to the excitement, I have a give-a-way for you guys! Now it’s nothing special but with it being National Craft Month, I have decided that I want to learn how to create appliques. Well, I tried, and it didn’t come out as the greatest, but I do think that it is cute and think that it would be a nice give-a-way! 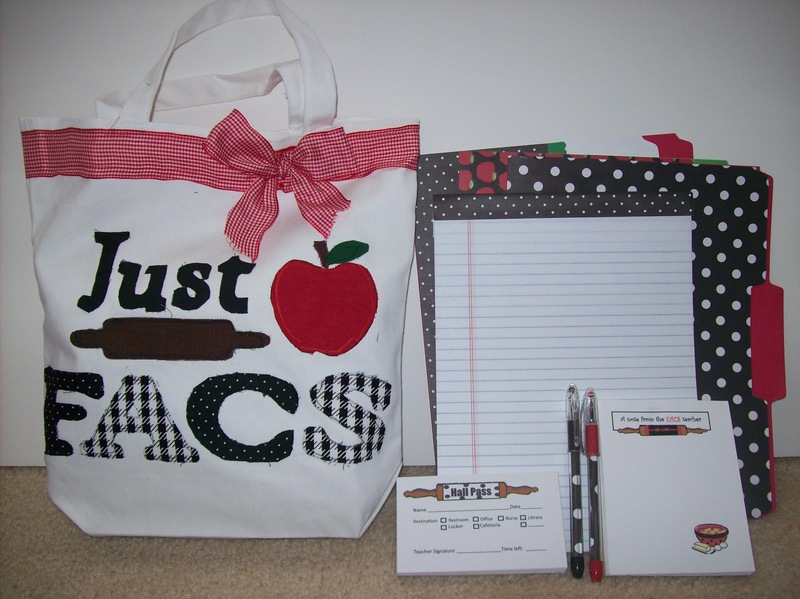 So, I will be giving away a “Just FACS” totebag filled with goodies! All you have to do to win this Just FACS gift set is Like my Just FACS facebook page (you can use the link in the column on the left or click the link in this post)! Your name will entered into a drawing and the winner will be annouced on Sunday, March 6, 2011! Good luck and see you on Facebook!!! And as always have an awesome weekend!